It’s rare for Maintenance Manager Mitch Freeman to encounter an Indian Trails or Michigan Flyer passenger. Yet everything he and his team do helps to ensure that you and your charter group have a safe, smooth ride with us. Mitch came to Indian Trails a decade ago, having grown up on a farm where he enjoyed tinkering with the equipment. “My passion is fixing things,” he says. He started with us as a service technician and quickly learned about all the factors that go into maintaining and repairing a fleet of motorcoaches. His staff deals with any problems that arise with the coaches, and does preventative maintenance such as changing oil, checking tires and conducting safety checks. 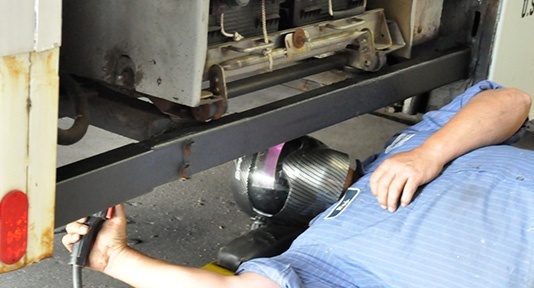 Sometimes the maintenance staff is alerted to possible mechanical glitches by our drivers, who conduct mandatory inspections of their coaches every time they take them on the road and return. If a driver experiences a problem with a coach while on the road, he or she can contact our Dispatch Center, which operates 24 hours a day, 365 days a year. 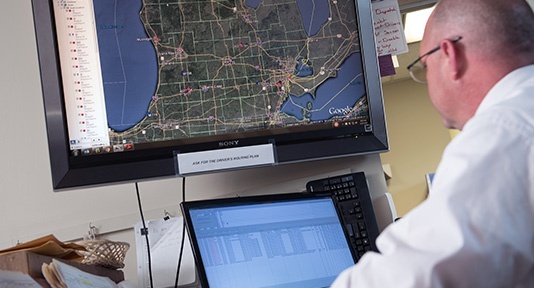 Our Dispatch crew tracks all of our motorcoaches—across Michigan and throughout the U.S. and Canada—relying on satellite-based GPS systems and onboard computers that are coupled with Electronic Logging Devices. ELDs not only collect GPS data, but monitor the speed of each bus, any idling or hard braking events, and various engine performance metrics. Such information can signal that a part is wearing out, and enable us to make repairs before a breakdown occurs. If a breakdown does occur while a coach is on the road—and if it’s in reasonable driving distance of one of our maintenance facilities—Dispatch can get one of our mechanics there. For coaches further away, Indian Trails can call upon a vast network of bus companies and repair facilities for assistance. Altogether, Indian Trails has a fleet of 80+ vehicles, including 50+ over-the-road motorcoaches ranging in capacity from 34 to 56 passengers, plus 26 transit buses (like cities use) to provide contract shuttle service, and two mini-buses. Each year, our vehicles collectively transport more than 1.7 million passengers over 5 million miles. Since we trade in older coaches for new ones regularly, operational problems are typically minor and easily repaired. Ready for the art experience of a lifetime? Then take your group on a mini-vacation to visit ArtPrize in downtown Grand Rapids between September 19 and October 7! There, you can see more than 1,000 works of art in every conceivable medium by 1,500 artists from across the U.S. and around the world. 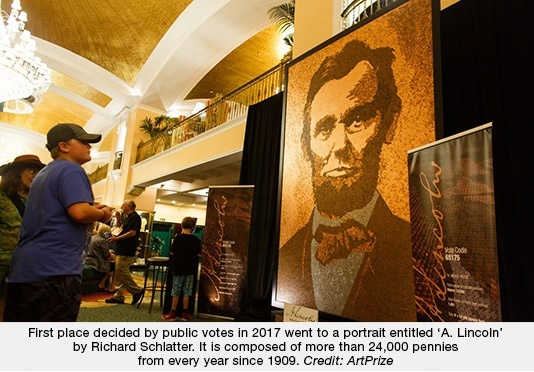 For them, it’s a chance to show their work and compete for more than $500,000 in prizes—$200,000 of which is decided by public vote, $200,000 by art experts. For you, it’s totally free. The art is exhibited in museums, bars, public parks, restaurants, theaters, hotels, laundromats, auto body shops, vacant storefronts and office spaces—nearly 200 venues altogether. So, get a group together and charter a deluxe Indian Trails motorcoach (capacity 34-56 passengers) for an “art party weekend.” The driver would pick up your group at a designated location in your town, and then get you to and from the event in style. Our customer service folks will happily guide you through the charter process. Just call 800-292-3831. Or, get a quote online in advance. With all the assistance available on the ArtPrize website, you could plan the excursion yourself. However, their team will help design your group’s custom ArtPrize experience. 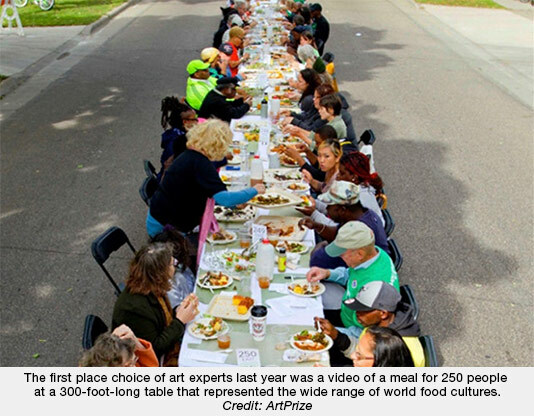 Contact education@artprize.org to setup a planning session. To soak in the artwork all weekend, your group could stay at one of Grand Rapids’ fine hotels, many of which offer special discounts and free shuttle service to and from ArtPrize. For answers to most questions that a group visiting ArtPrize from out of town might have—including accessibility options for people with disabilities—click here. Want to visit ArtPrize without a group? With Indian Trails’ daily, scheduled routes, it’s just a relaxing, affordable motorcoach ride from locations all across Michigan. 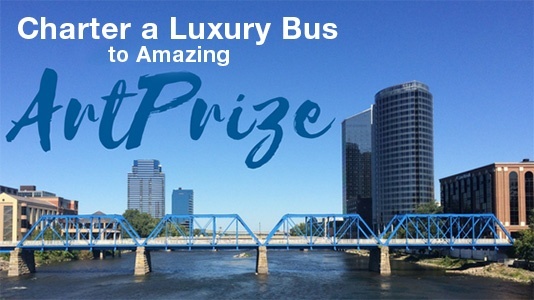 For example, for a mere $28 roundtrip, you could leave from East Lansing’s Intermodal Terminal at 2:30 p.m. on Friday, Sept. 21, arriving at the Rapid Central Station in Grand Rapids at 4 p.m. After an art-filled weekend of wonderment, you could then catch a return coach on Sunday at 4:45 p.m., arriving back in East Lansing at 6:10 p.m. Check ticket prices and schedules here. In 1910, Thomas Edison demonstrated the first talking motion picture, and the Henry Ford Company was selling its Model T vehicle. And in the little town of Owosso, Mich., Wayne and Cora Taylor founded the Phillips-Taylor Livery Service, which specialized in moving passengers and freight from the Durand Union Train Depot to points around Shiawassee County. Over 100+ years, that mom and pop business evolved into Indian Trails, Inc.—Michigan’s first and largest privately owned bus transportation company, with more than 180 employees. Currently, we have an eco-friendly fleet of 80+ buses—more than 50 of which are deluxe motorcoaches—that carry passengers throughout Michigan, the United States, and Canada. 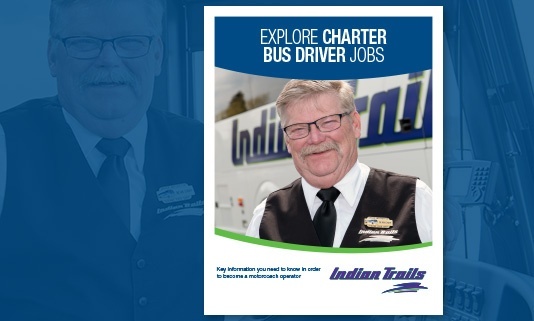 A big part of Indian Trails’ business, which is still headquartered in Owosso, involves operating buses over 38 daily, scheduled inter-city routes throughout Michigan and into Chicago, Milwaukee and Duluth. These routes offer over 100 boarding points, and direct connections with both the Amtrak and Greyhound national transportation networks, and the Detroit and Flint international airports. Our subsidiary airport shuttle service offers 12 roundtrips daily between East Lansing, Ann Arbor and Detroit Metro Airport (DTW), connecting two great university towns with one another, as well as with upwards of 700 daily nonstop flights between DTW and the world. Launched in 2006, Michigan Flyer transports more than 220,000 passengers annually with 98 percent on-time reliability. Since 2012, it has also operated the Ann Arbor-DTW segment of its route as “AirRide” in partnership with the Ann Arbor Area Transportation Authority. As you may know, we also operate a large group charter business specializing in custom transportation solutions for corporations, K-12 schools, colleges, sports teams, trade associations, non-profit organizations and others. Customers include Girl Scouts of America, Michigan Education Association, Detroit Lions and Detroit Red Wings, Walmart, Quicken Loans, Mormon Tabernacle Choir, U.S. Army, Ford Motor Company, United Auto Workers, and our state’s great public universities. A group can charter one or more Indian Trails motorcoaches to leave from anywhere in Michigan, northern Ohio or Indiana, for travel to any destination in the continental U.S. and Canada. From the start, the leadership of Indian Trails embraced challenges and change. Circling back to our indomitable co-founder Cora Taylor in 1914, she applied for—and was granted—a chauffeur’s license, becoming the first woman in the United States to be issued one. (She is also recognized as the nation’s first woman taxicab driver and was inducted into the Michigan Transportation Hall of Fame in 2006). 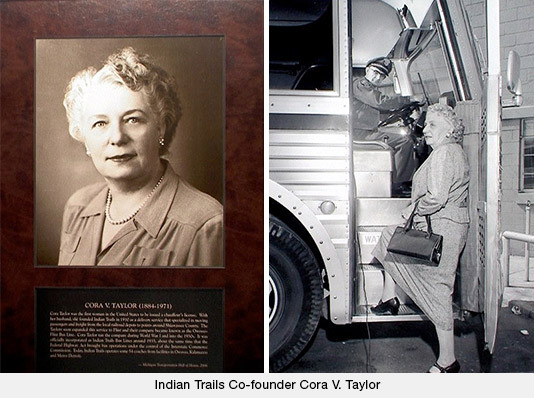 When Cora Taylor helped build the company by driving auto workers to new factories in Flint, the company became known as the Owosso-Flint Bus Line. By 1930, it had a terminal in downtown Lansing; 30 diesel buses serving Lansing, other cities across Michigan, and Chicago; and nationwide connections with railroads and other bus lines. In its history, the company has only had five presidents — Wayne and Cora Taylor, their nephew Bill Himburg, his son-in-law Gordon Mackay, and now Chad Cushman, who succeeded Mackay in 2016. Along the way, Indian Trails has quickly adopted customer-centric innovations such as reclining seats, air conditioning, and two-way radios. We were the first bus company to install video monitors, stereo sound systems, WiFi, and hearing loops in its fleet. 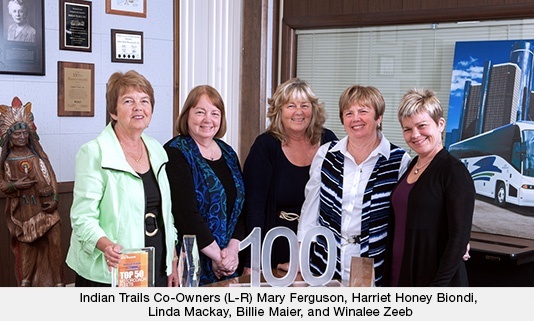 Today, 108 years after it was founded, Indian Trails is co-owned by our late president Bill Himburg’s daughters (who are the Taylors’ great nieces): Mary Ferguson, Billie Maier, Linda Mackay, Harriet “Honey” Biondi and Winalee Zeeb. They continue our tradition of quality, excellence and innovation in transporting customers to their destinations. Do you have a friend or family member who’s looking for a career change? If so, you might want to let them know that Indian Trails, Inc., currently has openings for professional drivers. That’s because we operate Michigan's newest and largest fleet of motorcoaches, and our business is thriving. If you or someone you know is interested, please review the details and apply online here. It takes a special person to be a professional bus driver. To us and to our passengers, they’re truly heroes of the road. And Indian Trails offers a great 4-5 week PAID training program, as you’d expect from a company that the U.S. Department of Transportation ranks among the top 5% nationally for safe driving. Do you have the right stuff to become a professional driver? Learn more about the job here.